From the author of the bestselling A Year By the Sea, comes the inspiring story about how her and Joan Erikson's friendship pushed them to remember the importance of transformation and sustained them through their unique challenges. Shortly after arriving on Cape Cod to spend a year by herself, Joan Anderson’s chance encounter with a wise and astonishing woman helped her usher in the self-discoveries that led to her ongoing renewal. First glimpsed as a slender figure on a fogged-in beach, Joan Erikson was not only a friend and confidante when she was most needed, but also a guide as Anderson stretched and grew into her unfinished self. JOAN ANDERSON is the author of the bestsellers A Year by the Sea and An Unfinished Marriage. She has also written numerous children’s novels, including 1787, The First Thanksgiving Feast, and The American Family Farm, as well as a critically acclaimed adult nonfiction book Breaking the TV Habit (Scribner). 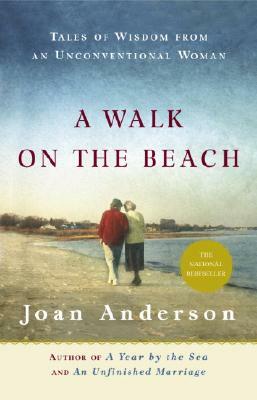 A Walk on the Beach is her third work of narrative nonfiction. A graduate of Yale University School of Drama, Anderson lives with her husband on Cape Cod. "In A Year by the Sea and An Unfinished Marriage, Anderson shared her account of taking a break from her marriage and spending a year of solitude at the beach. Now, she introduces the inspiring woman she befriended during that time: Joan Erikson, wife of psychoanalyst Erik Erikson. After a chance meeting in their Cape Cod town, the women found their stories--one woman was purposefully apart from her husband; the other was adjusting to her husband's deteriorating health and imminent death--resonated significantly. Erikson's enthusiasm for life prompted Anderson to re-evaluate her own marriage and her role as she aged through the life stages that were the subject of Erikson's published writing, coauthored with her famous husband. Erikson reminded Anderson of the importance of continuing to learn, grow, change and, most notably, play as one ages, to be surprised by life and where it leads. She explained, '[A]s long as we are alive, we must keep transforming ourselves.' Through the death of Erikson's husband and the return of Anderson's, readers see the women cheer each other's efforts to view the world with a fresh eye each day. While Anderson's experiences may ring familiar to readers of her earlier works, this is much more Erikson's story and philosophy, and for readers, every encounter with her is as much a treat as it was for Anderson, who wrote of her friend, 'it was [she] who made me new, or at least [she] pushed me toward the brink.'"